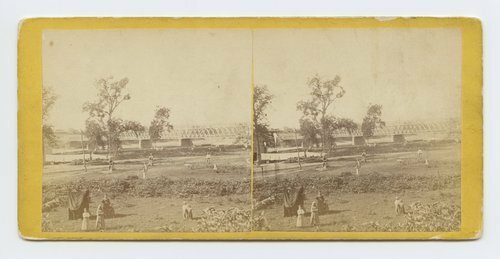 This stereograph shows the turnpike bridge across the Kansas River at Lawrence, Kansas. There are people and the photographer's dark tent visible in the foreground. It is from Alexander Gardner's series, Across the Continent on the Union Pacific Railway, Eastern Division. Turnpike bridge across Kansas River at Lawrence Kansas. 323 miles west of St. Louis Mo.